(Mostly) accurate depiction of this Saturday’s tasting wines. A blend of Grenache Blanc, Clairette, and Bourboulenc, this full-bodied white is fruit-forward with citrus, peach, and subtle floral notes. This California beauty is produced from vine clones from Dijon, the birthplace of some of the Burgundy’s most prestigious wines. Full-bodied with notes of apricot and tropical fruit, this wine is oaked, but not overly so; 8 months of sur lies aging in French oak impart a subtle creamy vanilla note. Produced by Gil Family Estates, the folks behind Ateca, Juan Gil, and the highly-rated Clio, Honoro Vera 2013 Monastrell is made from 100% organic grapes from the northwest of Jumilla. The wine is dark, rich, and aromatic with notes of ripe berries, fresh herbs, and a hint of peppery spice. Closer to black than to red in color, this well-aged, perfectly balanced Montepulciano d’Abruzzo defines “big.” Pronounced notes of ripe berries, dried flowers, and pleasant spice are rounded out nicely by 12 months of oak aging and an additional 12 months of bottle conditioning. Part of a highly limited release of 322 cases, Redd Brand Syrah is a blend of 95% Syrah and 5% Mourvedre. This hearty Washington state red is described by the winemaker as vibrant and muscular with notes of blueberry, smoked game, cassis, and lemon peel. 2005 in Bordeaux is widely regarded as a spectacular vintage, and the Château Fougas Maldoror 2005 is certainly no exception. Complex and layered with notes of blackerry, cassis, and cedar, this wine is drinking beautifully, but will continue to develop with age, if you can resist opening it now! Hailing from the Côtes du Roussillon AOC, Domaine Thunevin-Calvet Cuvée Constance is a blend of 50% Grenache and 50% Carignan. The wine has been aged for just over a year in concrete tanks, rather than oak, allowing for bright, fresh, pronounced fruit character and hints of stone and minerality. This classically huge California red blend is made up of 30% Merlot, 23% Petit Verdot, 17% Zinfandel, 16% Petite Sirah, 10% Syrah, and 4% Malbec. The result is a hefty yet smooth wine with hints of cherries, blueberries, black currant, and vanilla, along with some woody undertones, thanks to careful aging in French and American oak. California’s 2011 vintage was a tough one; rainfall was lacking, so yields were considerably lower than in previous years. But that didn’t stop Hope Family Wines from creating the standout Liberty School 2011 Merlot. Fermented in stainless steel and aged for 12 months in 50% French and 50% American oak, this dark, silky red is fruit-forward and well-structured with notes of dark plum, cherry, and bright, ripe berries. Having featured their 2010 Mourvedre in a previous tasting, we’re already big fans of Curtis Winery. Their 2012 Cuvée Red is a blend of 39% Grenache, 26% Mourvedre, 19% Cinsault, and 16% Syrah, resulting in a rich and smooth Rhône-style wine with notes of black currant, warm spice, and a long finish. Since we enjoyed the Liberty School 2011 Merlot so much, we decided to feature another wine from Hope Family Wines. The Candor Lot 5 Zinfandel is a blend of several of their best vintages, which results in the perfect expression of the California Zin – robust, jammy, and smooth with lots of berries and a hint of spice. If you’re not familiar with 90+ Cellars, you’re in for a treat. This Boston-based company buys the unsold wines from top-rated wineries, rebrands them with their own label, and sells them for a fraction of their original price. Boasting notes of dark plums, substantial spice, and a hint of vanilla on the finish, the 2013 McLaren Vale Shiraz is a veritable behemoth of a wine, and a perfect example of the style. You’ll be glad this one arrived just in time for barbecue season. And that’s the lineup, as it stands – to taste any or all of these wines for FREE, stop by this Saturday anytime between 2 and 7 p.m., and tell as many of your friends as you can! As always, this lineup is subject to change, but that just means there might be a few pleasant surprises on the way. 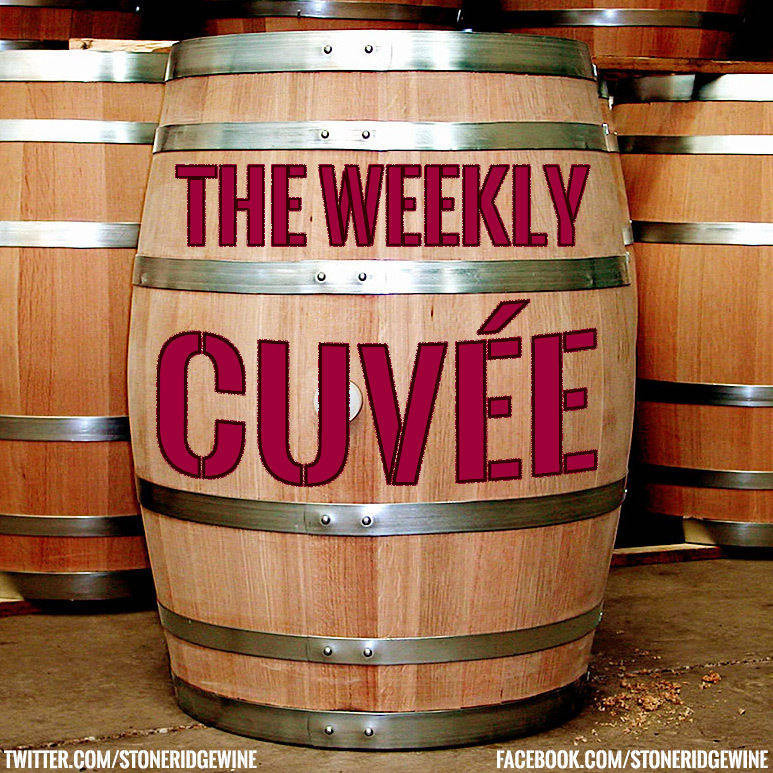 It’s time for another edition of the Weekly Cuvée! Sure, it’s been 2 weeks since the last edition, but that just means we have a lot more to talk about this time around. For anyone who missed the last one, the Weekly Cuvée is our (semi-) weekly wine and spirits news roundup. So without further ado, here’s what’s been going on in the wine and spirits world as of late. First off, Great Northwest Wine reports that the 2013 Washington State grape harvest brought in upwards of 220,000 tons of grapes, shattering the previous record of 188,000 tons in 2012. This significant increase in tonnage is due to the large number of new vineyards in Washington. “We’re not seeing any big surprises as far as yields being up or down,” Kevin Corliss, vineyard operations director for Ste. Michelle Wine estates, told Great Northwest Wine. Corliss added that Merlot and Syrah yields were a little better than they predicted, while Cabernet Sauvignon fell behind slightly. Back in New York, Sen. Charles Schumer recently announced his support of a proposal to remove a Prohibition-era law banning the shipment of alcohol through the United States Postal Service, according to USA Today. Currently, the shipment of beer, wine, and liquor is restricted to private shipping companies – the new law would only allow federally licensed breweries, wineries, and distilleries to ship via the USPS. According to Schumer, removal of the law could bring an estimated $225 million to the struggling Postal Service. And now for some global news – some of you may have heard the recent rumors of a worldwide wine shortage. Thankfully, experts have rebuked these rumors, according to an SFGate article. While a report from MorganStanley claimed the world’s wine demand surpassed supply by around 300 million cases in 2012, analysts say wine production has “increased significantly” while “consumption is stabilizing.” So while we, of all people, are not going to tell you not to stock up (we have great case discounts! ), we will say that it’s probably not necessary to panic. Finally, three whiskeys we love (and carry!) have made it on Wine Enthusiast’s list of 7 Must-Try New York Whiskeys. While we’re glad Catskill Distilling Company‘s Defiant Rye Whiskey, Tuthilltown Spirits‘ Hudson New York Corn Whiskey, and Warwick Valley Winery & Distillery‘s Black Dirt Bourbon all made the list, we find it a bit surprising that there was no mention of the Widow Jane Bourbon Whiskey. Regardless, it’s nice to see some New York State spirits featured in a publication as prominent as Wine Enthusiast. And that’s it for this edition of the Weekly Cuvée – check back next week for our very first wine review, and be sure to ‘like’ us on Facebook and follow us on Twitter if you haven’t already! Got a suggestion for our next review? Feel free to leave it in a comment!